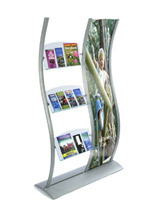 These publication displays have an eye-catching, curved design to make your literature stand out! 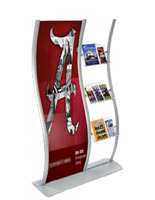 These indoor stands, publication displays feature acrylic pockets to help organize and disperse your literature materials. Not only is acrylic rugged, but it will also better showcase pamphlet advertisements and artwork. 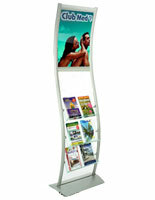 Publication displays, also known as brochure holders, are ideal for hotel lobbies, bank foyers and waiting room lounges. Any indoor environment, where information is requested, would benefit greatly from the addition of these holders. 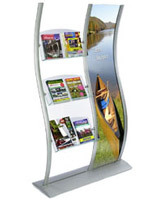 These publication displays use the same s-curve side supports as our other wave-shaped fixtures. Constructed from brushed aluminum, the overall structure of the holders will withstand rust and scratches when used indoors. 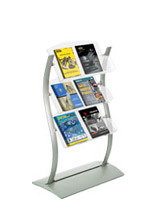 These pamphlet racks, publication displays are also adaptable! Each acrylic pocket is attached using adjustable brackets you can slide up or down the aluminum supports. 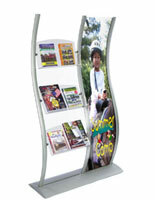 We even offer these publication displays with graphic frame areas for displaying posters. These literature units are also double-sided publication displays! 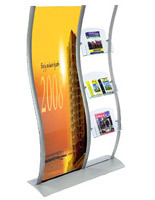 We provide our publication displays with (2) clear, plastic lenses to keep graphics in place. 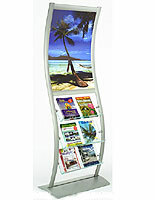 You can use the double-sided image frame to generate more consumer traffic at your display. 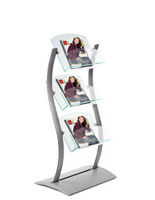 Catalog stands will help you organize your reading materials, while still keeping them accessible by your guests. 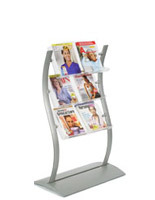 The periodical racks, catalog stands will also add a modern element to any indoor furnishings. 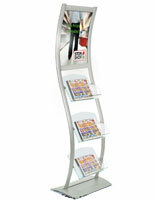 These display fixtures are also adjustable catalog stands! You can use the aluminum brackets to change the height and orientation of each pocket. 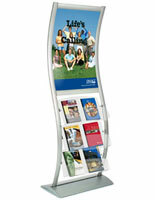 We even provide these catalog stands with (2) clear, plastic lenses to support a poster or graphic. You can use them to create a double-sided fixture! The image frame can help you draw even more attention to your publications. 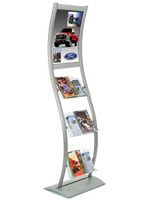 These catalog stands, such as our other curved fixtures, have a fun, structural element your customers will love! These literature holders cannot be ignored! 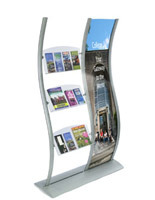 The brochure stands, literature holders combine a large poster frame with a floor-standing literature rack to create an undeniably eye-catching fixture. Literature holders, also known as marketing units, feature acrylic compartments to organize and disperse promotional materials and brochures. 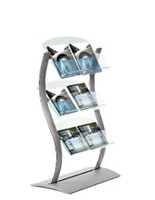 We offer these literature holders with either clear or green-edged acrylic compartments. Clear acrylic is a neutral way to showcase headlines and advertisements appearing on your pamphlets, while a green edge adds a bit more style. 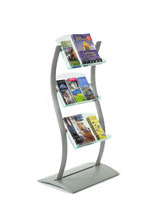 Literature holders are constructed from brushed aluminum and have a alluring, smooth silver finish for supplemental appeal. When used indoors, these curved fixtures are resistant to rust! 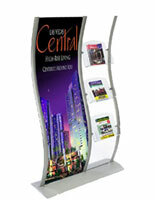 These retail stands are also doubled-sided literature holders! We provide your literature holders with (2) clear, plastic lenses to protect your graphics and keep them in place. 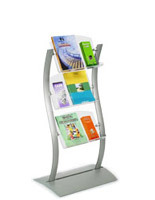 The brochure racks, literature holders feature adjustable brackets to alter the height, orientation and angle of each acrylic compartment. Visitors are able to see your display and view your publications from any direction. 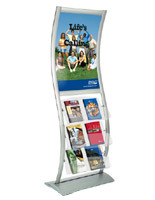 These literature holders, such as our other wavy display stands, are optimal fixtures for retail stores, lobbies and entryways. 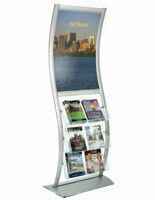 Publication displays, such as our other designer literature racks have an undeniable presence customers cannot ignore. 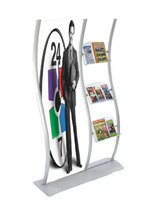 In addition to these unique stands, we sell a variety of POP presentational units for showcasing products, literature and graphics. 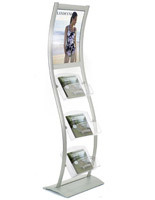 Displays2go is your one-stop shop for all product presentation fixtures. Thank you for shopping with us at Displays2go!